A San Luis Obispo resident lost more more than $1,200 worth of property after leaving valuables in an unlocked car in the 200 block of California Boulevard. Among the items that were stolen was a credit card, which two Arroyo Grande men were later caught using at local businesses. On Sunday, the victim of the theft contacted police and informed SLOPD that the stolen items included jewelry, makeup, luggage, purses, sunglasses and a credit card. Detectives obtained video of the suspects from one of the stores at which the stolen card was used, a SLOPD press release states. Police publicized the photos on social media, stating the suspects used the stolen credit card at four locations. The social media post described one of the suspects as having “albino” type features. Several people, including a a Pismo Beach police officer, then contacted SLOPD with the identity of the suspects. Around 4 p.m. Tuesday, Arroyo Grande police officers stopped the suspects near Oak Park Boulevard and Branch Street. Two SLOPD officers then came to the scene and arrested the men. Officers charged Kyle Brown, 22, with possession of burglary tools, possession of stolen property and fraudulent use of a credit. Nathan Morgan, 28, is facing charges of possession of burglary tools, possession of stolen property, fraudulent use of a credit card, possession of paraphernalia and possession of heroin. 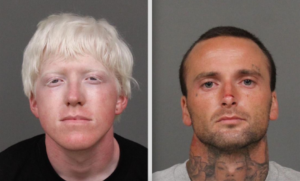 Officers booked both Brown and Morgan into the the San Luis Obispo County Jail. Brown’s bail is set at $4,000, and Morgan’s bail is $12,000. At least local police followed up. A cousin in Fresno had her home broken into, thousands of dollars of stuff stolen, place was completely trashed ,and the stupid crooks used her Penney’s credit card and ordered $9000 worth of stuff sent to their house in their own name! She got a printout from Penney’s, identified the perpetrators (former neighbors no less), yet in Fresno they are “too busy” investigating murders to care about property crimes. Neck tattoo. Might as well have a sign on your back that says arrest me.